Is a cost effective method for applying words, numbers or simple designs to a traffic cone. 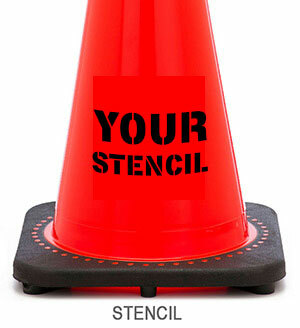 Stenciling a cone can be used to identify your company, agency or a particular location. The process itself starts with an artwork file or our standard stencil font which is sized for the particular cone and then cut onto stencil material, the stencil is applied to the cone and then our proprietary ink is rolled over the sheet, passing through the perforations and onto the surface of the cone. Also called silkscreen process. a printmaking technique in which a mesh cloth is stretched over a heavy wooden frame and the design ( logo), is applied with specially formulated inks made to adhere to traffic cones. The process starts with a vector or other suitable graphic file which is them printed onto the mesh material and attached to the frame. 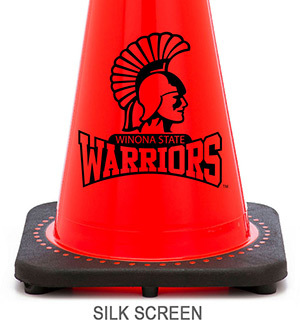 The silkscreening process for traffic cones does not allow for multiple colors, since the registration (lining up) of the different screens is not possible due to the specific cone shape nature of traffic cones. Silkscreens will allow for detailed and intricate logos and single color artwork to be applied to cones in a variety of standard ink colors. ( Black, White and Blue) Custom ink colors are available, our customer service department will be happy to work with you to find an ink color for any project you have ( certain fees will apply for custom colors). Get the artwork you want on your cones. Our exclusive new process allows us to create any logo or design you want on your traffic cone or delineator. We use a state of the art permanent vinyl adhesive and laser cutting to achieve the color and shape of the artwork you want. Send us your ideas and we will make them come to life.